Hey everyone! Sorry for the hiatus. I’ve moved to New York City and needed the time to get things in order. But I’m back now and raring to talk about how to use three-act story structure in comic strips. Recently, I gave a lecture at The Center for Cartoon Studies Summer Workshop introducing the very basics of three-act story structure. Since the majority of students were entirely new to the idea of story structure and the rest of the week’s curriculum focused on creating comics that were no longer than one page in length, I knew the graphic novel approach I usually take on my blog wouldn’t work. 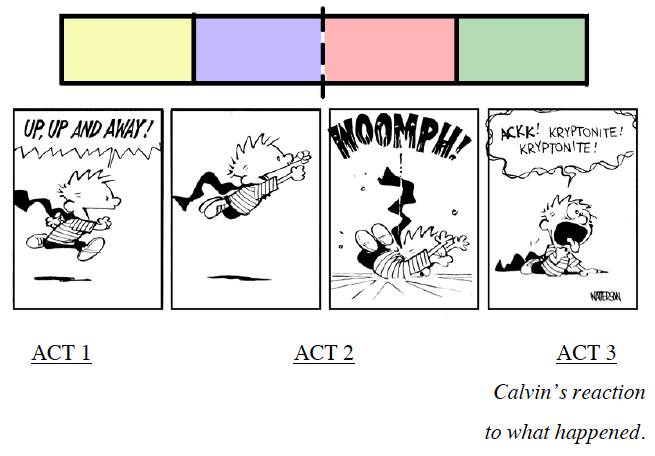 So, I developed a lecture on how three-act story structure is present in stories no longer than 4 pages, including daily comic strips. 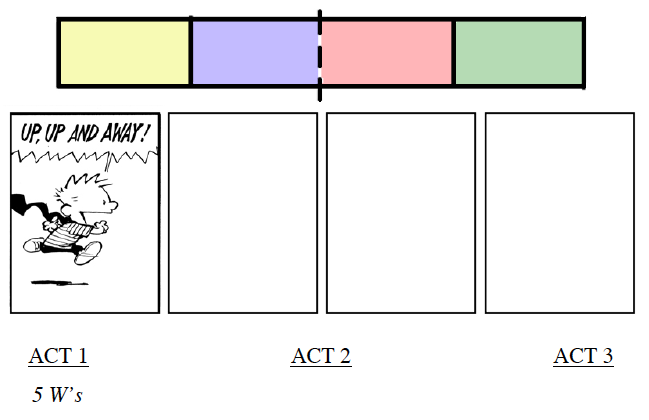 In just three to four comic panels, you can utilize three-act structure to tell a story. If there’s conflict and a character reacting to that conflict then you’ve got a story and that can easily fit within three or four comic panels. Act 1 is the “Beginning”, where information is setup to provide CONTEXT for the story. 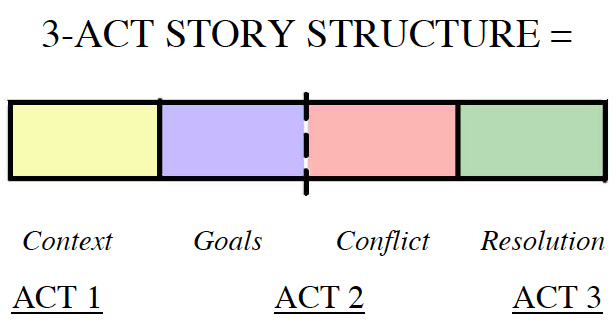 Act 2 is the “Middle”, where characters attempt to achieve GOALS and encounter CONFLICT. Act 3 is the “End”, where there is a RESOLUTION to the CONFLICT and our character’s character is revealed. Panel 1 (yellow) is Act 1. It provides the CONTEXT for the strip, answering the 5W’s: Where, When, Who, What and Why. Where are we? A white space. We may be inside or we may be outside, it doesn’t matter. The rest of the strip should make sense without that information. (If it doesn’t make sense, then Bill should have clarified). Who is involved? A kid. We know his name is Calvin from the title of the strip, Calvin & Hobbes, but within the CONTEXT of Panel 1, it doesn’t matter. All we really need to know is that the character is a kid who plays pretend. What are they doing (their GOAL)? Playing Superman. And we know that by the use of Superman’s trademark line “Up, up and away!” along with the cape. & Why are they doing that? Probably because playing Superman is fun. Now that the CONTEXT has been established, we want to see the character attempt to achieve a GOAL and face CONFLICT in Act 2. Panel 2 (blue) shows the character trying to achieve their GOAL – the WHAT from Panel 1 put into action. It can also be called the PREMISE of the strip. 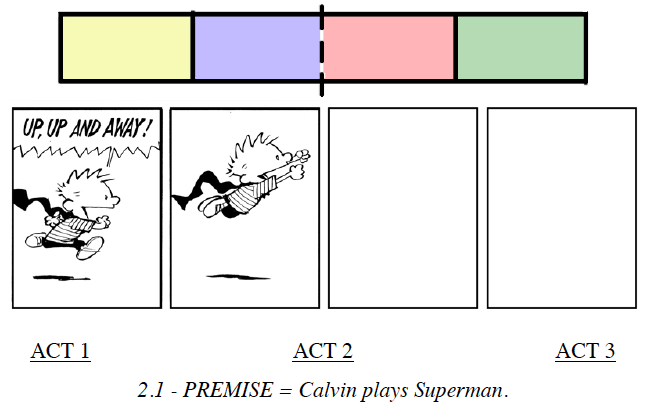 Using the same example, Calvin’s GOAL is to play Superman, so in Panel 2 we get to see Calvin doing just that: playing Superman. But there is no story without a problem. So, there must be CONFLICT. Something (a person, a thing, fate, or a force of nature) must CONFLICT with the character’s GOAL. This CONFLICT brings the potential DEATH OF THE PREMISE. 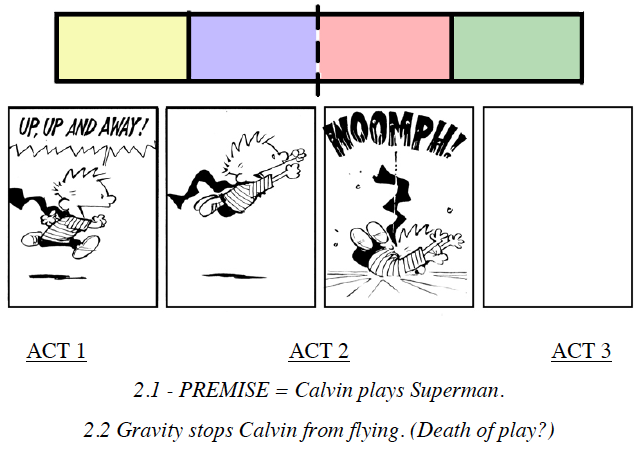 In Panel 3 (red), gravity prevents Calvin from flying (CONFLICT). Will this be the DEATH of playing Superman?! NO! Calvin continues to play Superman despite the reality of his situation, thus revealing something about his character. Character is revealed through conflict and Panel 4 (green) is where we get to see that. Panel 4 is the RESOLUTION of the CONFLICT, and that RESOLUTION lets the reader know something about your character. This is where you get to show how your character behaves or thinks. In a well-written comic strip, it results in something funny or unexpected. Calvin has every reason to give up pretending to be Superman but he refuses and improvs his way back into play. Why? Because play is more fun than reality (and if you’ve read Calvin & Hobbes, you’ll know just how true that is for Calvin). Where are we? A white space. When are we? Day or night is not specified, but it is set after those bubble bottles were created and mass-marketed for kids. What are they doing (their GOAL)? Blowing a bubble. & Why are they doing that? Blowing bubbles is fun? Panel 2 [Act 2.1] – GOAL (WHAT in action. The PREMISE): Calvin blows a bubble. 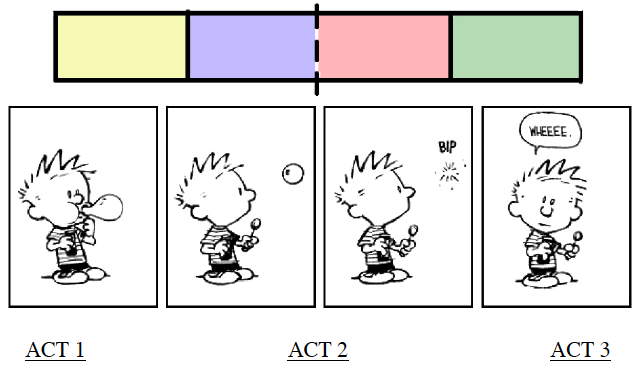 Panel 3 [Act 2.2] – CONFLICT (DEATH OF THE PREMISE): Calvin is stopped in blowing a bubble. Is this the DEATH of blowing bubbles? Panel 4 [Act 3] – RESOLUTION: Yes. Calvin’s reaction to what happened reveals his character. The best part about Panel 4 is that different characters can provide a totally different outcome or joke from the same PREMISE. Where are we? Outside a store. GOAL (WHAT in action. The PREMISE): Nancy blows a bubble. 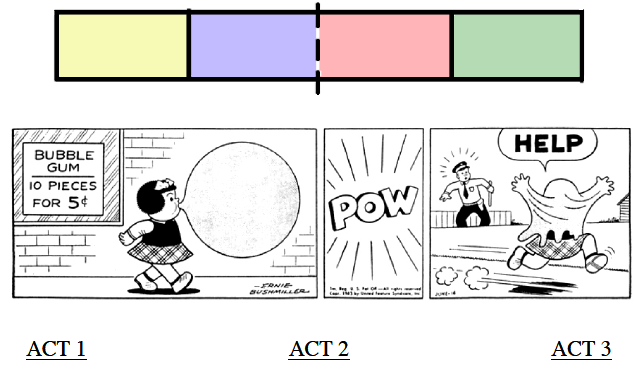 Panel 2 [Act 2.2] – CONFLICT (DEATH OF THE PREMISE): Nancy is stopped in blowing a bubble. Is this the DEATH of blowing bubbles? Panel 3 [Act 3] – RESOLUTION: Yes. Nancy’s reaction to what happened reveals her character. So, when writing your own comic strips, keep this breakdown in mind and use Panel 4 to show the reader what makes your character interesting, funny or unique. Excellent insight, Tim…it shows how plot structure is there, even in a super-short strip! I especially like the “death of the premise” notion; Save the Cat talks about how that hint of “death” always exists in a well-structured story…I understand that better now, thanks to this article. Thanks! Thanks, Sean! I appreciate it. Once I had this comic strip structure, I started using it to create individual scenes in a larger narrative. It works really well for that, too, because every scene has its own premise and there’s conflict in every scene resulting in the potential death of the scene’s premise. Try it out. Let me know what you think. Excellent! I’m starting a panel comic and I was looking for resources to help out and this is brilliant. I’m not familiar with the “death of the premise” concept (I can guess at it) but do you have any sources to illuminate my oh-so-dim brain? The “death of the premise” is present in a number of story structures and story analyses. My fav is Blake Snyder’s Beat Sheet (https://timstout.wordpress.com/story-structure/blake-snyders-beat-sheet/), where the “death” is discussed in the “All is Lost” beat. Best of luck with the comic strip. Awesome insight, thanks so much. Definitely a huge help, any bit of info helps. Thanks again!! Hey, I’m a teacher in Oregon and I was wondering if you would let me use your stuff in my class for a project this week? Sure thing. My only request is that you attribute the work you use (for example, putting timstout.wordpress.com in the corner of the slide or worksheet). I hope it goes well! Thank you so much!!! And will do! Such good content and makes me focus on how to tell the arc in just 4-5 panels. Really helped me distill down a kid story and made it better. Donation on the way, totally felt like I went to coffee store, bought you a cup of java, and had a great discussion on short form structure using comic panels for an example. Hey! The “5Ws” help me work with no hassle. It’s a cinch! Thanks. How would you use this for a longer comic. Like say 22 pages or a graphic novel of 50-100 pages? I do love how you made it way easier to understand though. I would just like to use it for a longer comic. In the final draft script, each of the 16 beats below ended up being 15 pages (15 pages x 16 beats = 240 pages). In my rough draft, sometimes beats were 20 pages long, which meant I had some fat to trim. And sometimes they were 12 pages long, which meant I had cut that beat too short and I needed to flesh it out to give it more weight. Breaking the 240-page project down into these smaller chunks helped me know whether or not each page was serving a purpose in the story. How to Create a Legendary Hero Short Notes on Long Comics is Now an Ebook!